When I first made contact with Home-Start I knew I was at a point of withdrawal and felt quite isolated in dealing with my son’s difficulties on a daily basis. However, with my volunteer’s support, we have been able to chat, laugh and work through some of the problems I have been faced with. As well as being given the opportunity to catch up on a few errands while our volunteer is here, just simple things like making phone calls to change appointments can be a mammoth task in itself. What has also been nice is to see the interaction and relationship that has built between my son and volunteer and this has to be attributed to her great patience when working with my son. Luckily the nurse recognised that Katy was depressed and told her to visit the doctor. “The day I visited the doctor was a turning point,” said Katy. “She was very sympathetic, and gave me contact numbers for support groups including Home-Start. I was assigned a volunteer, Sheila, who would come on a Thursday and we would go out. As well as being hands-on, she was easy to talk to, non-judgemental, knew when to step in to diffuse a crisis, and how to do it without taking control. She also understood my need to have a strict routine. I would always look forward to Thursday because “the cavalry was coming”. When I visited Katy I realised that the very strict routine which Katy had put into place was, in effect, controlling her life. But I was pleased when, almost a year later, Katy had progressed so much that I was able to move volunteer Sheila on to another family. 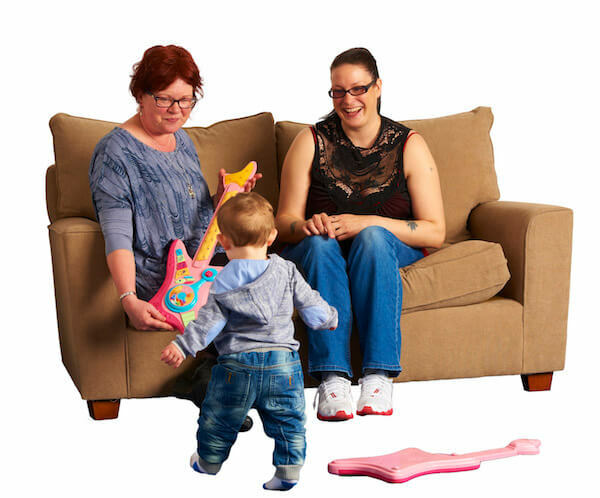 Home-Start has given me so much confidence to just get myself out and meet new people. I attended the Family Group on a Thursday morning. I have made lots of new friends who are in a very similar situation to myself. At the group I have done several courses such as a Parenting Course and a Communication Course. We have had quite a few massage treatments and relaxation classes which have come in really useful. Home-Start have given me the opportunity to take my children on trips to Farmer Ted’s and Chester Zoo, which as a single parent I would not have been able to afford. My volunteer isn’t just my helper but she has become a very good friend and someone I can trust and rely on without being judgemental. She has given me lots of confidence and shown me I can do lots of things that I didn’t think were possible. We had lots of fun decorating my living room which I didn’t think would be fun. Also on the practical side she has taken me to hospital appointments and shopping. She is great to talk to and I wouldn’t be without her. Overall, Home-Start have helped me and my children immensely.